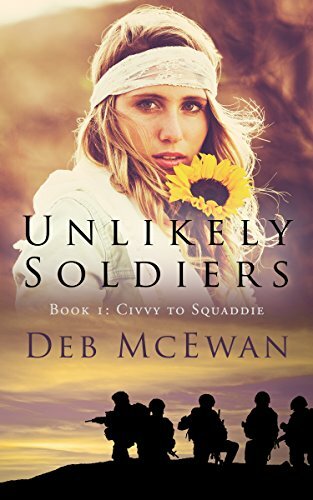 about this book: Unlikely Soldiers starts in Great Britain during the nineteen seventies. Britain had her first female prime minister, mobile phones and the internet had not been invented and flared trousers and cheesecloth shirts were all the rage. Women were still fighting for equal pay, John Travolta was everybody's heartthrob and the first Star Wars movie hit our cinemas. The Bay City Rollers, ABBA and David Essex were big in Britain, and so were Queen, Status Quo, Madness, and Slade. My female protagonist, Michelle joined the Army in 1979 (as did I). She discovered a devastating family secret and had to get away, and would never have met Guy Halfpenny if she'd stayed in the small Welsh village she called home. If you fancy a trip down memory lane or wonder what life was like in nineteen seventies Britain, this may be the book for you. Unlikely Soldiers covers many controversial issues of the day and contains military humour, and language. If you're a fan of fluffy, happy books, give this a miss. Are you ready to discover how lives are shaped, friendships forged and loves won and lost in this gripping, coming of age adventure of love, humour, and tragedy?